NEW National Garbage Man Day Shirts Available Now! 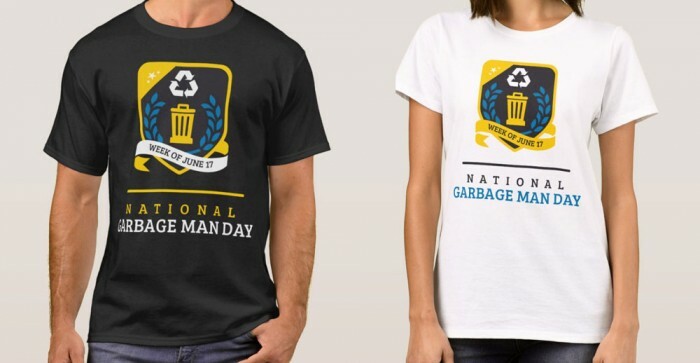 The National Garbage Man Day Store has been updated with new shirts, mugs and other giveaway items just in time for National Garbage Man Day 2019. Order shirts for yourself, friends, employees and neighbors. We offer sizes specific to men, women, infant’s and children because we know supporters of the waste industry come in all sizes. Looking for small gifts that help spread the waste industry love? We have button pins, magnets, hats, mugs and notebooks. These are perfect for giveaways in your company or at community events. Help spread the word and raise awareness, encouraging more people to join the National Garbage Man Day movement, because everyone in the waste industry should be thanked and celebrated. Order your National Garbage Man Day Swag Today! Don’t miss out. Place your order for National Garbage Man Day products today to ensure they arrive in plenty of time before the week of June 17. Looking to place a bulk order? Contact us at [email protected] to discuss bulk ordering options. Would you like to celebrate National Garbage Man Day by giving out shirts to everyone at your company? We thought you might. To enter the giveaway, simply submit the giveaway entry form with your name, company name, email, phone number and the number of employees at your company. One lucky person will win free National Garbage Man Day shirts for their entire company! The winner of the National Garbage Man Day Free Shirt Giveaway will be announced at WasteExpo 2019! For a complete list of rules, visit the Official Giveaway Rules. Looking for a job in the waste industry? Whether you are looking for general laborer positions or executive level responsibilities, Waste Jobs Today is the place to look. Find your new waste industry job today. It’s quick, easy and confidential. Whether you are looking to advance your career or start a new one, Waste Jobs Today can help. Looking to hire new talent at your company? Post a job today and find your ideal candidate. GarbageTruck.info is your premier classifieds platform specifically tailored for the Waste Management industry. Buy and sell garbage trucks, trailers, parts and more on GarbageTruck.info. We make waste industry equipment transactions easier than ever. Simply create your ad and let the offers arrive in your inbox. Looking to buy? Search by category and location to find the right equipment near you.